ONGC Tripura Asset Recruitment 2019 - Below are various recruitment notifications published by Oil and Natural Gas Corporation, Tripura Asset, Agartala / www.ongcindia.com. As of now, we don't have any active recruitment notification by ONGC Tripura Asset featured here. We may update as soon as the organization announces a new job notification. If you are looking for any information related to previously organized recruitment drives by ONGC Tripura Asset, you can browse through previous job notifications mentioned below and get the new updates or information you are looking for. ONGC Tripura Asset Recruitment 2019 - Apply Online for Apply Online for 85 Non-Executives Posts - Tripura Asset in ONGC Tripura Asset, Agartala, Tripura. 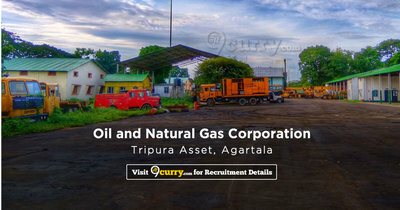 Online Applications are invited by Oil and Natural Gas Corporation, Tripura Asset, Agartala from 30 Jan 2019 to 19 Feb 2019 06:00 PM for 85 vacancies. 08 3 Years Diploma in Mechanical/ Petroleum Engineering. Minimum Physical Standard required as per table-4 below. 03 Diploma in Pharmacy of minimum 2 years duration. Should be registered with Pharmacy Council. 04 Graduate with Typing speed 30 w.p.m. Certificate/ Diploma of minimum duration of six months in Computer Applications in the office environment. 02 High School or Class X Equivalent Board Examinations with Science, and Trade Certificate in Auto/ Motor Mechanic trade. 01 High School or Class X Equivalent Board Examinations with Science and Trade Certificate in Surveying. 01 Intermediate with 6 (Six) months training/ experience in Security with the minimum physical standard as per details are given below at Table 3. Physical Efficiency Test as per details is given below at Table 5. 800 Mtrs. Race within 6 minutes. Lifting and carrying a person of approximately his own weight by the fireman lift method without any break to a distance of 100 meters. Climbing a fire service extension ladder of 27 feet (9 Mtrs.) fully extended in 2 Minutes. On the basis of Physical Standard Test/Skill Test/ Physical Efficiency Test/ Typing tests. Eligible candidates may apply online at OTPC's website (direct link is given below) from 30 Jan 2019 10:00 AM to 19 Feb 2019 06:00 PM. Candidates log on to http://e-apply.in/agnex0118/.